Radon Gas is a serious matter and it cannot be detected with a Geiger Counter or any standard radiation detection equipment. It requires a specialized device - a Radon Gas Detector. We purchased one of these detectors for ourselves and put in in the room where we stored our Uranium ore samples. The device indicated over 100 pCi/L ! For reference, the average indoor reading is 2pCi/L... at a reading of 100 pCi/L, immediate evacuation is called for. 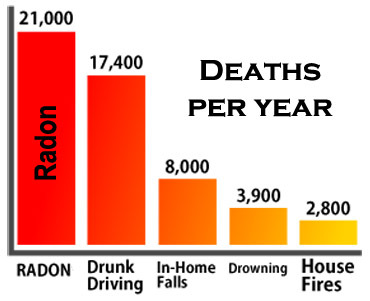 You certainly don't need to have hundreds of pounds of Uranium ore in your house to have a dangerous Radon gas level. 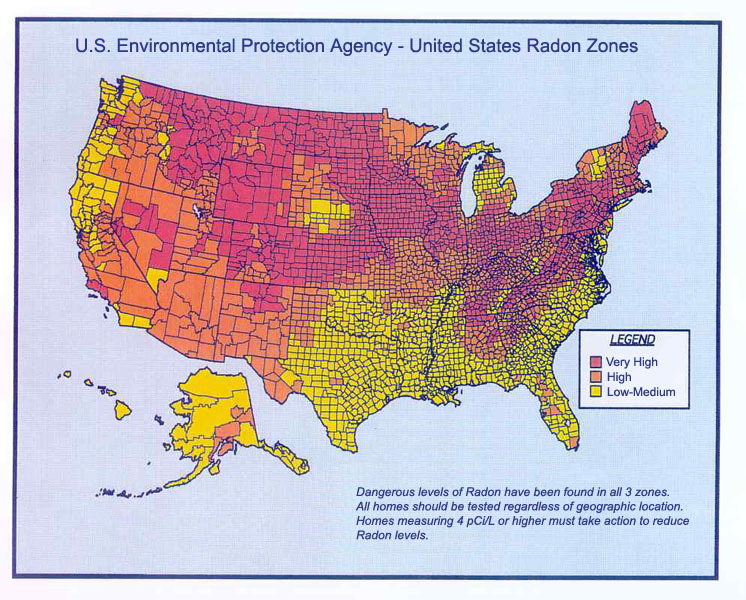 There are ordinary homes all throughout the U.S.A... in every state... that have deadly concentrations of Radon gas. Radon is a colorless, tasteless, and odorless radioactive gas produced by the breakdown of uranium in the soil. When allowed to accumulate to high levels, it can be hazardous to long-term health. The Surgeon General has warned that radon is the second leading cause of lung cancer in the United States. Only cigarette smoking causes more lung cancer deaths. Radon levels in a home can vary greatly over a one-month period going from safe levels to dangerous levels and back to safe. The EPA currently states that corrective action should be taken if Radon levels exceed 4 pCi/L (4 Pico-Curies per liter) on a long-term basis. Radon gas is impossible to detect without the use of sensitive test equipment. 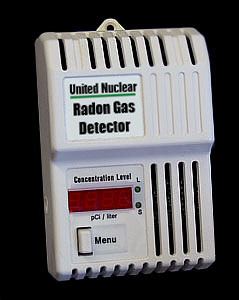 The United Nuclear Series II Radon Gas Detector is the only radon gas detector on the market designed for use by the homeowner. It's very easy to use - simply plug it in to any outlet and you're done. The rest is automatic. The unit will then sample the air and display the Radon level in your home. If it is dangerously high, it will notify you with an alarm. The detector allows the homeowner to monitor Radon levels in their home over time by displaying short-term and long-term averages. and see if you live in a danger area. No wiring or batteries needed; uses standard 110v household current. Initial results will display in approx 48 hrs on a numeric digital LED display, thereafter display updated every hour. 10 year sensor and a 1 Year warranty. Dimensions: 4.7" x 3.1" x 2.1"
Since we do sell Uranium ore samples, it's important that we stress a point. Collecting and storing a few Uranium ore samples is not going to create dangerous levels of Radon gas in your home. However, if you are and avid collector, and you have several pounds of Uranium ore in your home, you'd should consider buying one.